ASHA is updating its website for teens and young adults—iwannaknow.org—and we want to know what you think! Like this site, iwannaknow.org offers comprehensive information about sexually transmitted infections and a range of sexual health issues, designed for a younger audience. The website also has sections dedicated to parents and educators. 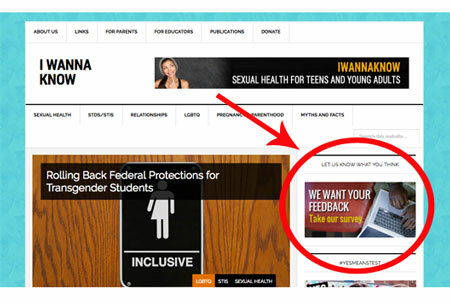 After you visit iwannaknow.org and look over the information and resources found there, you can share your thoughts with us by visiting the site and clicking on the survey banner found on the right hand menu (pictured above). The survey is short and should take more a few minutes to complete. You’ll be helping ASHA improve our efforts to keep young people informed about sexual health.